How can I register on the website? How can I add an advertisement? How can I find an advertisement? How can I add an advertisement in Super VIP category? How can I add an advertisement in VIP+ category? How can I add an advertisement in VIP category? How can I renew an advertisement? How can I top-up my credit? როგორ მივაბა აგენტი კომპანიაზე? How to clean up cache in Google Chrome? How can I register on the website? In order to completely use our services you should first register on our web page. Click the button Register on the main page. You need to activate your profile from the link you receive on your email. Please, sign in after you are registered and get the best experience from our services. How can I add an advertisement? Sign in and click the button My page. You’ll be redirected to your personal page, where you can manage all of your ads (add, remove, update, make Super VIP or VIP etc.). Click the button Add advertisement (you can do the same by clicking the button +Add on the main page), fill in all the required fields (required fields are marked with x). o First of all check the duration of advertising, deal type, real estate type and status, than the location (City/District, address). You can point out your real estate on the map by clicking the button mark on the map (then find your real estate on the map and click on it). Take notice: If your real estate has some components like balcony, loggia, gas, phone etc. you should check sufficient buttons. The other way in the ad will be shown that the real estate doesn’t have those elements. In theComment field you can write additional information about the real estate. The more complete information you add the easier will become for potential buyers to find your advertisement (and the probability of selling your real estate increases as well). To add the picture(s) click the button Add picture and choose the picture(s) from your PC. Here you can delete the pictures added by mistake (place your mouse on the picture and click the x button), or choose the one to become the main photo of the advertisement (place your mouse on the desired picture and click the button main photo). After filling in all desired fields click the button Add. If you are adding your advertisement on our website for the first time, you should activate your ad using the code received on your mobile phone. Note: The other time you’ll need to activate your ad again only if you change the phone number. Just after clicking the Add button, MyHome.ge administration sends an activation code via sms to your phone number (indicated when adding your advertisement). On the webpage appears the window, write down the received code in the field activation code and click the button Advertisement activation. Now your ad is active and you are using all the services proposed by MyHome.ge. Note: the above mentioned procedure is absolutely free and is required to ensure that you’ve indicated the correct phone number. How can I find an advertisement? First of all, choose the Real Estate Type(Apartments, houses and cottages, commercial real estate, land or hotels). You can choose deal type (for sale, lease, for rent or daily rent), location or other additional parameters and click the button search. Alternate way of searching an ad – finding the ad with the help of ID number, some part of text, or the author’s phone number: write down the text/numbers known by you in the field ID, phone or word and click the button search. In the filter block write down additional parameters or check the sufficient checkboxes and you’ll get renewed results. If you don’t want to filter by some parameters anymore you can easily remove it, just click on x button near the name of the parameter (in the search field, at the top of the advertisements). If you are satisfied with the search results and want to keep them for further usage, you can save the filter by clicking Save Search button (in the search field, at the top of the advertisements). How can I add an advertisement in Super VIP category? Super VIP ads always shown on the main page of the web site. When searching the ads by category, you can see the Super VIP ads first of all, then VIP+ ads, then VIP ads and then the other advertisements with the chronological order. 6 Super VIP ads are always shown on the main page of www.MyAuto.ge ; the system shows all Super VIP ads randomly. You should top-up your balance beforehand to move your advertisement to Super VIP category. Click the button My Page after you are signed in. Move the mouse to the right side of desired advertisement. The compact menu appears at once. Click the button Move to Super VIP, choose Pay from credit; mark the number of days you want your advertisement to be in Super VIP category, and click the button Add. The sufficient amount of money will be deducted from your credit and your advertisement will be in Super VIP category during these days. Super VIP category costs 7 GEL per 24 hours. How can I add an advertisement in VIP+ category? How can I add an advertisement in VIP category? There are two ways to move an ad to VIP category. You should top-up your balance beforehand to move your advertisement to VIP category. Click the button My Page after you are signed in. Move the mouse to the right side of desired advertisement. The compact menu appears at once. Click the button Move to VIP, choose Pay from credit; mark the number of days you want your advertisement to be in VIP category, and click the button Add. The sufficient amount of money will be deducted from your credit and your advertisement will be in VIP category during these days. When paying from credit VIP category costs 1 GEL per 24 hours. You should have sufficient amount of money on your mobile phone balance to move your advertisement to VIP category. Click the button My Page after you are signed in. Move the mouse to the right side of desired advertisement. The compact menu appears at once. Click the button Move to VIP, choose Pay by sms; mark the number of days you want your advertisement to be in VIP category, and click the button Text to send. You’ll see the window with the text (containing symbols and numbers); Send received text to the number 93099 (from Magti, Geocell). The sufficient amount of money will be deducted from your balance and your advertisement will be in VIP category during indicated days. If your advertisement already is in VIP category, after sending the above mentioned sms, VIP service will be prolonged with sufficient amount of days. Note: Please, be careful and send the sms according to the instruction given above. If you send an incorrect sms, your advertisement will not be moved to VIP category, but money will be deducted from your balance anyway. How can I renew an advertisement? How can I top-up my credit? i Pay >> other payments >> MyHome.ge/or MyMarket.ge >> enter the user name (you will pass on the authorization site) or the ID number of the user and pay the amount. Soon after the payment the amount will be reflected on your account. Top-up of the account shall be provided via VISA / Mastercard, the amount you transfer shall be reflected on user’s balance. In order to top-up the account from the credit card click on this Link. Enter the required amount of money and continue the top-up process with your credit card data, confirm the operation. The money you have paid shall be instantly reflected on your balance. In order to top-up the balance by the bank transfer, please write to us with the contact form, or e-mail to myhome@my.ge, enter your company's details (name, identification code), your user details email (user name) and your required amount. Our representative will send you an invoice on mail. Thus, you will transfer money directly from your company account to the "My.ge" account. Transferred amount will be reflected in your account balance. 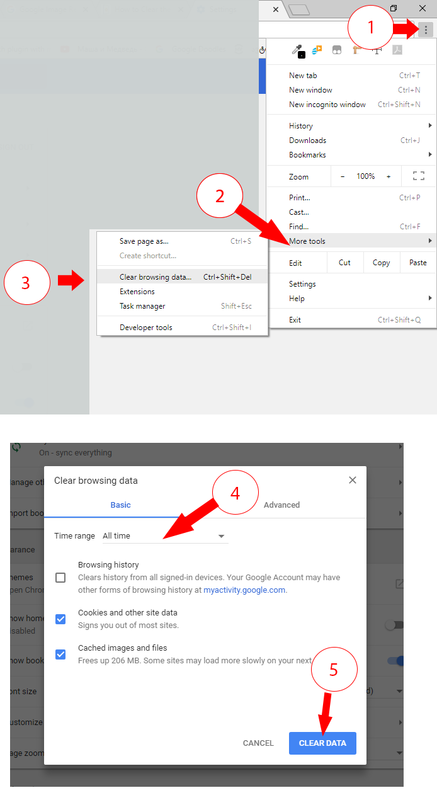 How to clean up cache in Google Chrome? Next to "Cookies and other site data" and "Cached images and files" check the boxes.